Diane Hunter asks Shughie McFee where the beef is and Shughie asks Glenda to fetch it from the cold store. Glenda returns and tells them it's not in the cold store. Shughie says it must be, a whole joint of meat can't just disappear. Benny asks Len Morton if he has been to the police yet, and Len says no. Len asks if he can stay on at Stonebank Farm. Benny tells Len that he thinks he is scared to go to the police. Benny tells Len to leave Stonebank and promises that he won't follow him. "Just clear off. Go away!" shouts Benny. Adam Chance joins Meg at the reception desk and tells her that a 14 pound joint of meat has gone missing from the kitchen. 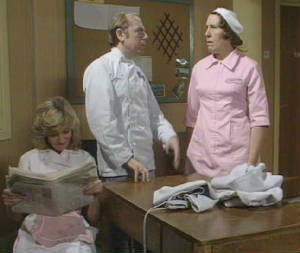 Meg goes into the staff room and finds Doris Luke and Len Morton there. Meg says she thought she made it clear that Len Morton wasn't welcome here, and Doris tells her that he has come to walk her home. Meg asks Doris Luke to come to her office when she comes off duty. Adam Chance asks Kevin if he would like to do some extra work painting the white lines in the car park. Doris Luke goes to the officeand Meg tells her that Len Morton isn't to come to the motel anymore. She says Doris is the only thing standing between Len and the police and he is using her. Doris says that isn't true. Doris tells Meg that Benny couldn't have managed without Len's help. She says Len knows he has done wrong and he is willing to put things right. Glenda tells Kevin that she doesn't like the thought of seeing a specialist and pouring out her troubles to a complete stranger. Kevin says the specialist can help her. Later, Kevin Banks asks Glenda how her visit to the specialist went. Glenda tells him that they discussed things that weren't even relevant. Len Morton goes to Stonebank Farm for his lunch. Doris Luke asks where Benny is and Len tells her that Benny won't eat with him. He says it was different when Benny was blind, then he couldn't see him. Doris asks him what difference that makes. Len says he is ashamed. "I'm leaving. You can tell the police if you want," says Len, and leaves. Benny comes into the kitchen at Stonebank Farm and Doris Luke tells him that Len has gone. Shughie McFee see's Diane Hunter in the kitchen sorting out the evening's takings. She tells him that there have been complaints about the fixed price menu's, and Shughie reminds her that it was her idea, not his. Diane says she is only asking for his co-operation. Shughie tells Diane that she is way out of her depth and it's time she realised it. Diane says in future he will pay as much attention to the fixed price menu's as the a la carte menu's. Diane asks Shughie if they could be friends because she needs his help to stop everyone from accusing each other. Shughie tells her that there is only one person it could be and that's Renee Haines. Diane tells Shughie that he hasn't got any rpoof unless he has a guilty conscience. "Are you accusing me?" asks Shughie. He tells Diane that he is handing in his resignation. "Right. Resignation accepted," says Diane. Shughie stalks out of the kitchen. Shughie McFee goes into the office and tells Meg and Adam that he has handed in his resignation and it has been accepted by Diane Hunter. He says Diane accused him of theft. Meg phones through to the kitchen and asks Diane if she would come into the office. Diane Hunter goes into the office and speaks to Adam and Meg. Adam asks her if she accused Shughie McFee of theft, and Diane says no, she merely pointed out that he couldn't go around accusing people. Meg asks Diane if she has thought of how she would replace Shughie McFee. Later Meg asks Shughie McFee to come into the office and Meg tells him that they have no choice but to accept his resignation. Meg tells Shughie that he can work out his months notice. Shughie says he won't work out a month's notice. "From this moment I am no longer in your employment," says Shughie and walks out of the office. Kevin Banks gives Glenda a letter which Glenda opens. She tells Kevin that it's from the hospital with an appointment for her to see the gynacologist for a check up. She tells Kevin that she ins't going to go. Shughie McFee comes into the motel restaurant on his day off and asks Diane for a menu. Diane tells him that last orders are at two o'clock and it is now 2.45 so he can't eat unless he is a resident. Meg Mortimer comes into reception and Shughie asks her if he can book into the motel for a few days. There is a knock on the door at Stonebank Farm and Doris Luke opens the door to Len Morton. Len tells Doris that he thought Benny might need some help. Kath Brownlow asks Glenda if she saw the letter addressed to her which arrives earlier, and Glenda says yes. Kevin tells Kath that it was a letter from the hospital with an appointment for Glenda to go to see a gynacologist. He says Glenda said she isn't going. Len Morton tells Benny that if he had been in Benny's place then he would have been scared. Benny grabs Len Morton by the collar and tells him that he isn't scared. Meg Mortimer comes in and asks what is going on. Diane Hunter gives Shughie mcFee his billl and Shughie complains about the meal and tells Diane that she musn't expect a tip. "You have a complaint?" asks Diane. Shughie tells her that the meal was terrible. He puts the money on Diane's tray. "Mr McFee. Allow me," says Diane, and taking the bill she tears it up. "Your meal was on the house," she says and walks off. Arthur Brownlow's boss, Mr Jenkins arrives at the motel and books a table for four in the restaurant. Kath Brownlow and Doris Luke come in to the motel through the main doors. Kath spots Mr Jenkins and is just about to go back outside again when she realises that Mr Jenkins has seen her. Mr Jenkins says hello to Kath and tells her that he was sorry that Arthur couldn't take the job in Newcastle. Renee Haines gives Archie Gibbs a cup of tea in the kitchen, and says she needs his advice. She tells Archie that she has a little money and she would like to invest it. Meg asks Doris Luke to come into the office and tells her that she went to Stonebank Farm and found Benny and Len Morton fighting. She says Benny had Len by the collar. Meg tells Doris that Adam Chance is going to Stonebank Farm to take some measurements because they are going to seel Stonebank sooner than they thought.